The Parishes of Naas, Sallins & Two Mile House have welcomed summer with a re-vamp to their Parish Website, which is a valuable resource for the ever growing population of the surrounding area. The website is visited by parishioners and visitors in great numbers. 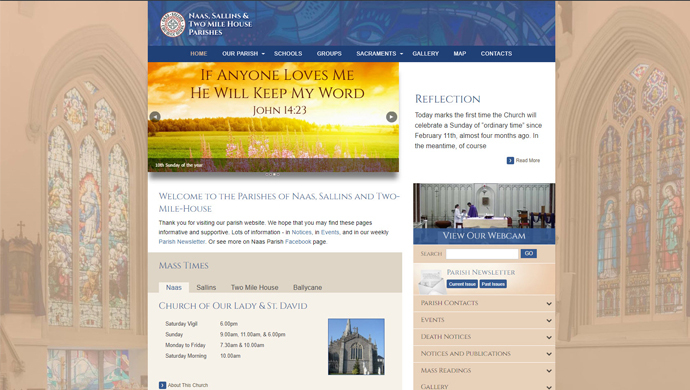 Naas, Sallins & Two Mile House Parishes website includes live streaming from Church of Our Lady & St. David, Naas, this service has really been appreciated by the housebound and those who want to attend funerals and other liturgical celebrations remotely. At Parish Websites we worked closed with The Parish Deacon Fergal O’Neill to ensure the site would have all the features his parishioners had become to depend on but with a fresh, modern feel and look. Such as upcoming events, notices, death notices and contact details for groups and community groups. Also, ensuring to move with the ever changing times Naas, Sallins & Two Mile House website is optimised for mobile and tablet, so keeping in touch with the whole community even when they are on the go! Fr. Gerard McAleer and his team at Donaghmore Parish, Co Tyrone went live with their new website in January 2019. It is all too common for parishes to feel overwhelmed by the job of maintaining a website. The websites we build for parishes include all the right features to make sure you can do the job you need to. Yet, are simple to update, amend, add-on and evolve. At the heart of our service is our friendly and experienced customer support team that will help you get up and running. Quickly and easily.